I had so much fun linking up with Oriental Trading during the back to school season, so of course I could not wait to collaborate with them for Halloween. When they asked me to pick out some fun Halloween items to review and share with you, I knew it would be the PERFECT opportunity to make some…Halloween FREEBIES for you! Let’s face the facts, October is a craaaaazy month. You’re just starting to get off into an amazing routine, and then…Halloween happens. Suddenly your once calm and patient students are running around like chickens with their heads cut off because they NEED to tell you about their bunny and superhero costumes in the middle of a math test. Sound familiar? I thought so! One of the parts of Halloween that always seem to creep up on me is the famous Halloween Party Day. 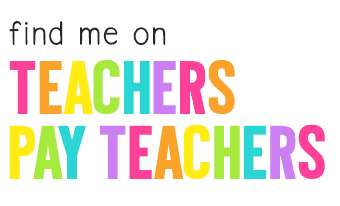 Teacher friends, the struggle is REAL. You want to cram some learning into the morning, but your students are so excited about their Halloween party in the afternoon, that you feel as though you might as well be talking to the pencil sharpener. 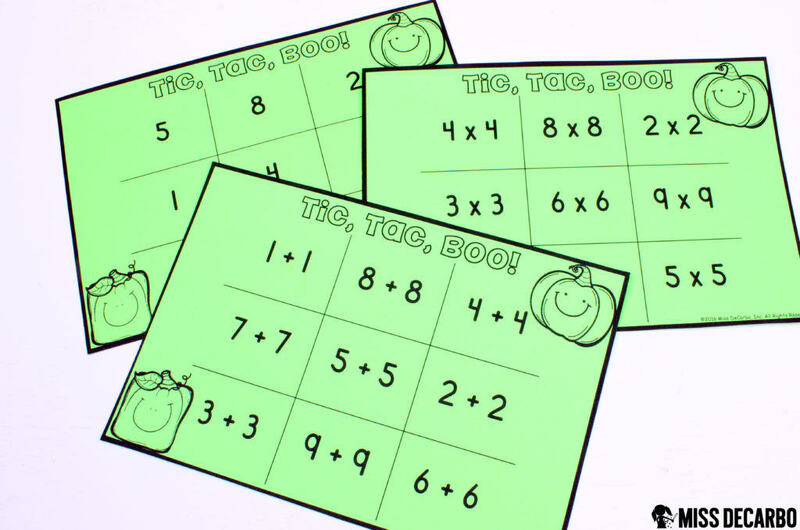 Enter: FUN and engaging Halloween learning activities that are fresh and new! 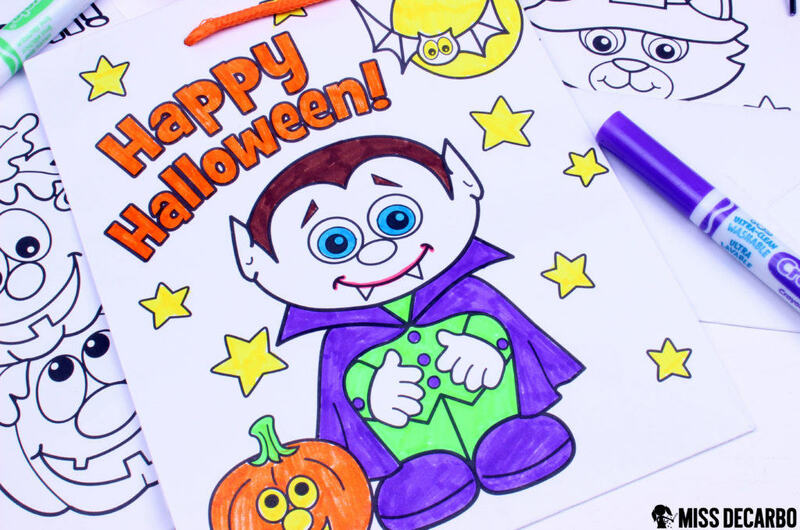 I’m going to share three fantastic activities to do with your kids on the morning, or during the week of you Halloween party. Let’s get started! 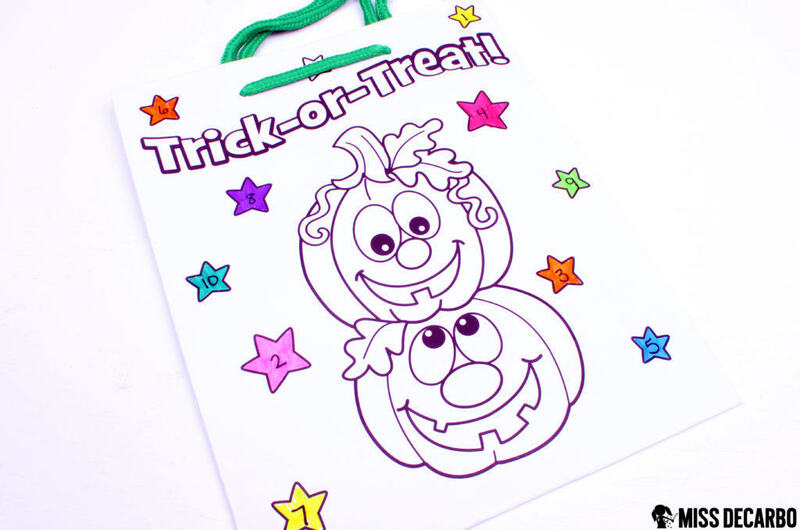 When I saw these Color Your Own Halloween Treat Bags, I knew they would be the perfect activity for our Halloween party day. 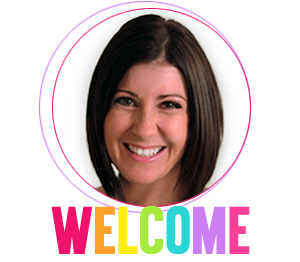 I am always looking for activities that are the “calm before the storm” when it comes to a classroom party. 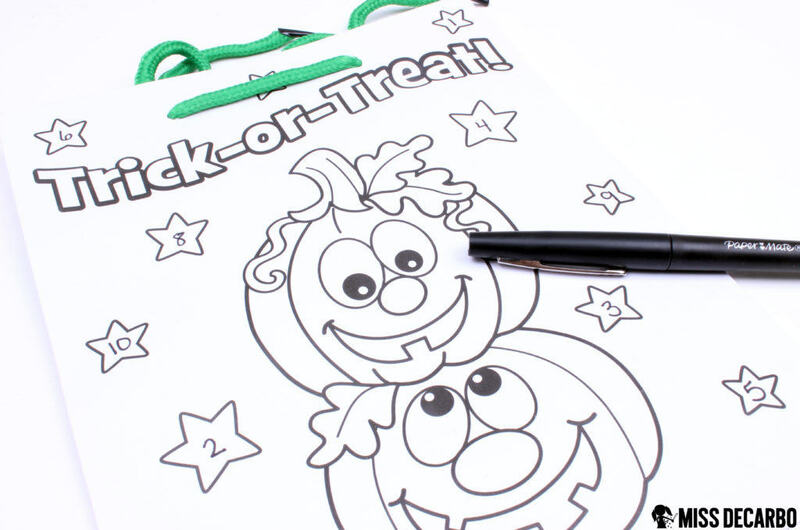 With these DIY treat bags, students can color the designs themselves prior the party beginning. This is fantastic because I like to have something the students are independently working on when the PTO parents come into my room and start setting things up. I used to try to make that activity a read aloud at the carpet, but as HARD as I tried and no matter how ENGAGING the read aloud was, the kids ultimately ended up spending the entire carpet time sneaking peeks of the action across the room. Allowing them to have some free creativity time while the parents set up our room for the party is the perfect quiet, calm activity – and so fun! Another quick little learning activity for these treat bags is to have all of the students place a single digit number in each star on their bag. Each pack of bags comes with three different designs, but all three designs contain cute little stars around the character. 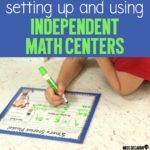 Afer all of your students have filled in their stars with single digit numbers, you can call out a math fact to the whole class, along with a color. Their job is to find the star with the sum (or difference, or product, or dividend) that contains that number, and color it in to match the color you gave them. 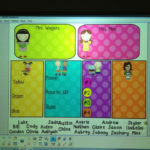 This little game is similar to coloring by code, only the kids are writing in their own code! After all of the stars are completed, the students can color the remainder of the bag any way they’d like. Oriental Trading sent me the CUTEST little bendable pumpkins and skeletons. 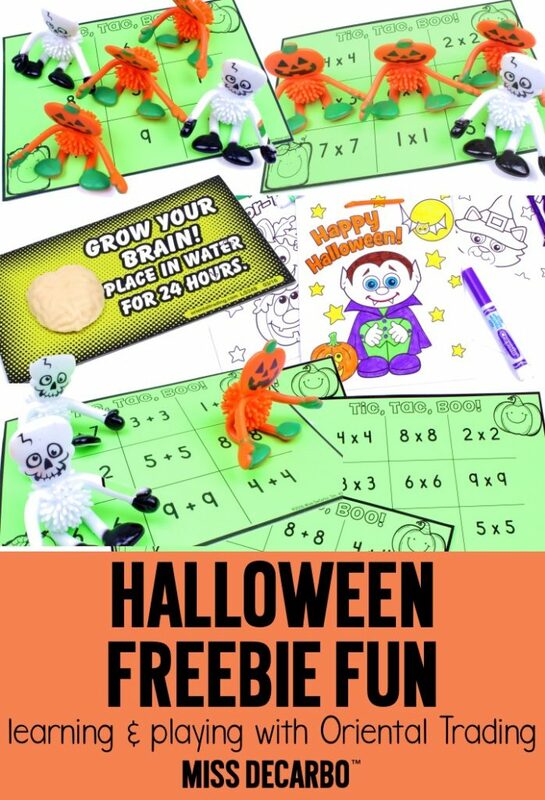 While I had SO many different uses and ideas for these little cuties in my head, I decided to make a Halloween freebie math game that is differentiated and can be played the morning of the party, in small groups, or as a partner game. 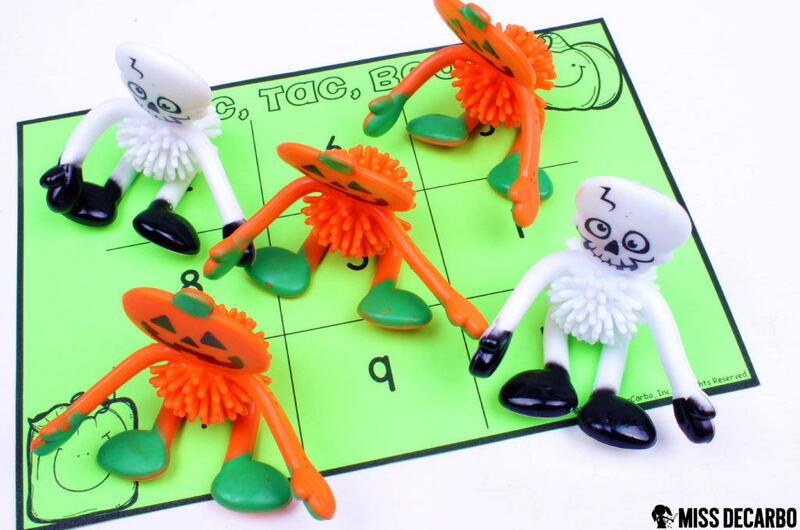 This Halloween freebie game is played exactly as Tic Tac Toe, and I used the bendable toys as the counters students would use to try to get three in a row. The twist? (There’s always a twist.) Before a player can cover up a space on the board, he or she must find the answer to the math fact and state it verbally to his or her partner. 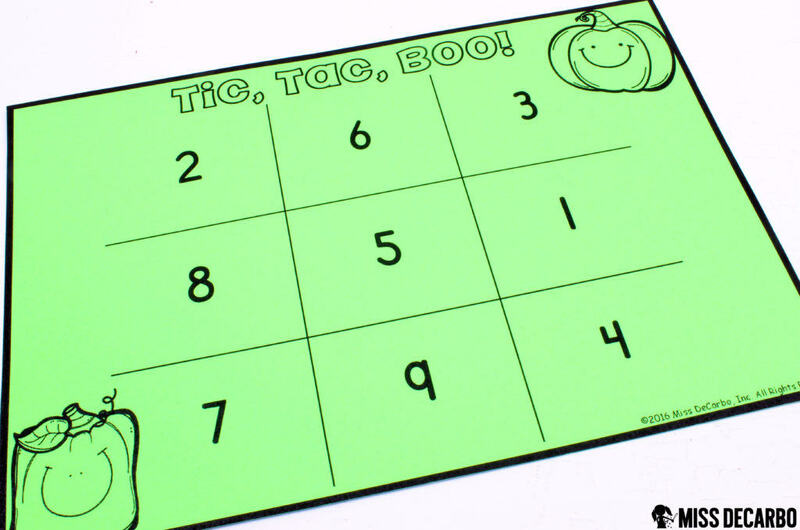 You can also use tokens, cubes, teddy bears, and other math manipulatives to play this game. 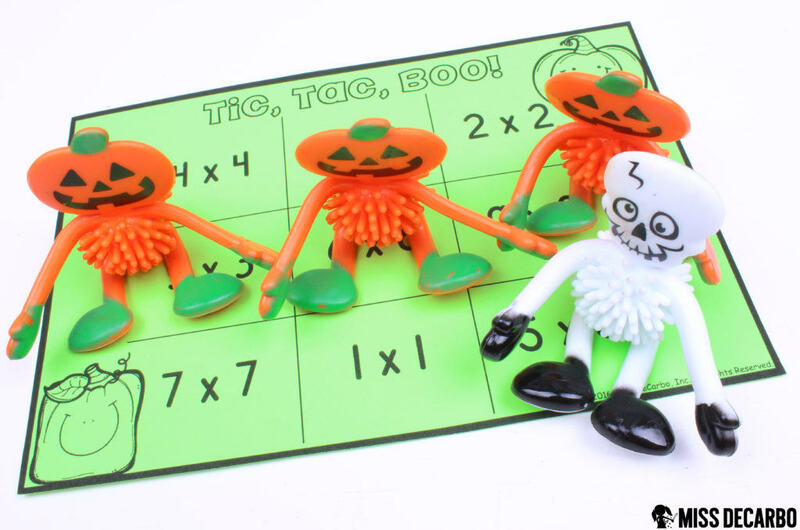 The little bendable cuties can be found HERE and they are so adorable for a math center that you want to reuse year after year during the Halloween season. I have made 3 different variations of the game for you: a kindergarten number identification game (shown below), a doubles addition fact version, and a doubles multiplication version. Below are photos of the kindergarten number identification game. The student will correctly identify the number on the space before placing a counter on it. 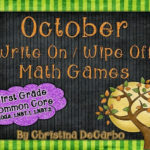 Click below to download these FREE math games for your classroom! 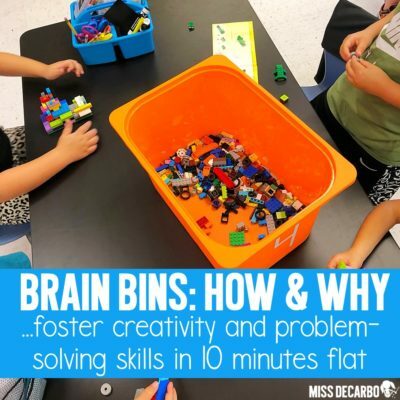 When I saw these super fun Growing Brains kits on the Oriental Trading website, I knew I just HAD to come up with a learning activity to go with them! 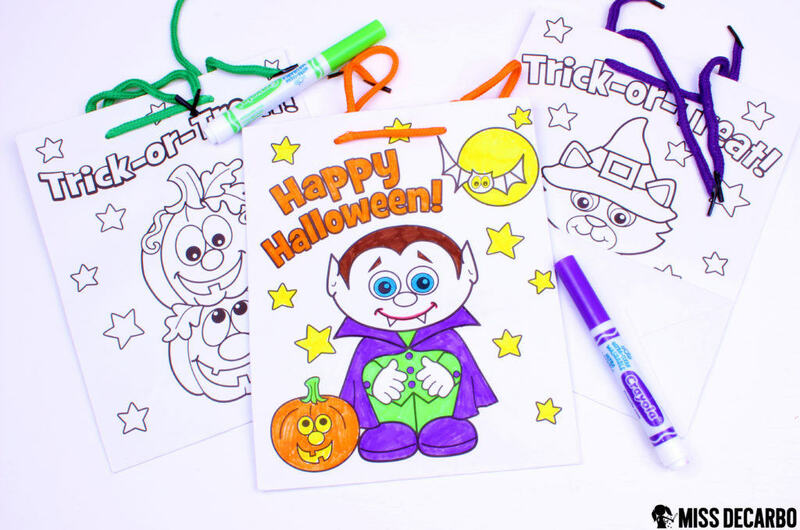 These fun little kits can really be used at any time of the year, but October just seems like the perfect time for this activity. I knew that these little kits would be the perfect science experiment that easily lends itself to growth mindset instruction. The pack of Growing Brains is $11.99, but you get 36 kits with each purchase. You could have every child grow their own brain, or you could have students work in partners or groups. In fact, you could even split the cost with another teacher and save money by completing the experiment in groups of 4! Below is a picture of each “kit.” It is a simple, tiny brain that is attached to a small card. 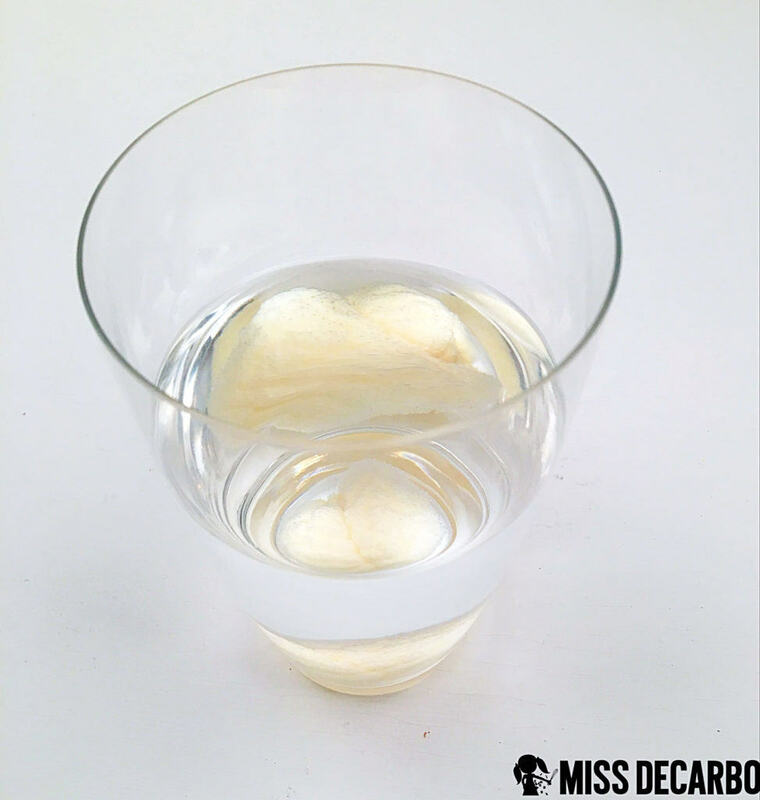 The experiment is simple: Drop the tiny brain in cold water for 24 hours, and watch it GROW! You will also want to learn from my mistake. The first time I did this, I put the sponge in hot water. I thought the warm water would help speed up the process. Well….don’t do that haha! 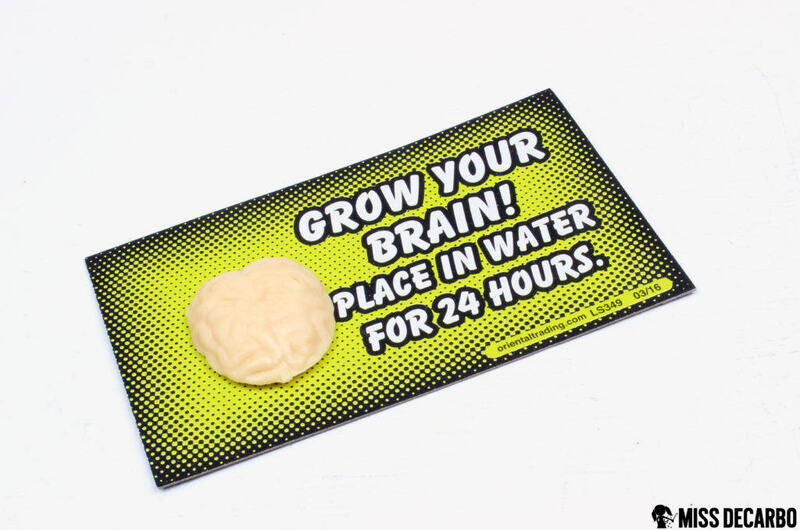 It completely dissolved the sponge, so place your tiny brains in COLD water and you’ll successfully grow your brain! Below is a picture of our enlarged brain! So fun, right?! When you do the experiment, build schema by first discussing WHY sponges get bigger when placed in water. Explain to your students that sponges have “empty space.” When that empty space is filled with water, the sponge expands, or gets bigger. In the same way, our brains have “empty space” that is just waiting to be filled with new knowledge and learning. Just like this tiny brain, our brains can grow and increase in size when we challenge ourselves, learn new things, and never give up. I LOVE these little kits because they are the perfect concrete manipulative to bring a very abstract concept of growth mindset to life! At the end of the experiment, they have a little token to take home with them that will remind them of how powerful learning and having growth mindset is. 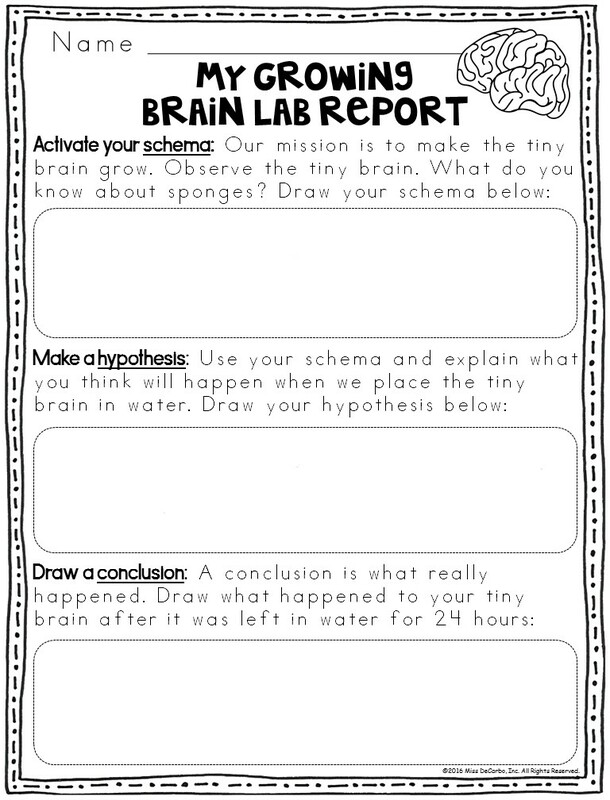 I created some differentiated lab reports AND differentiated reflection printables for this Grow Your Brain experiment and activity! Below are photographs of the picture versions of the lab report and reflection page. 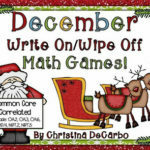 The free download I have available for you at the end of this blog post will also include two additional pages for each activity that include writing lines AND two full lesson plans! 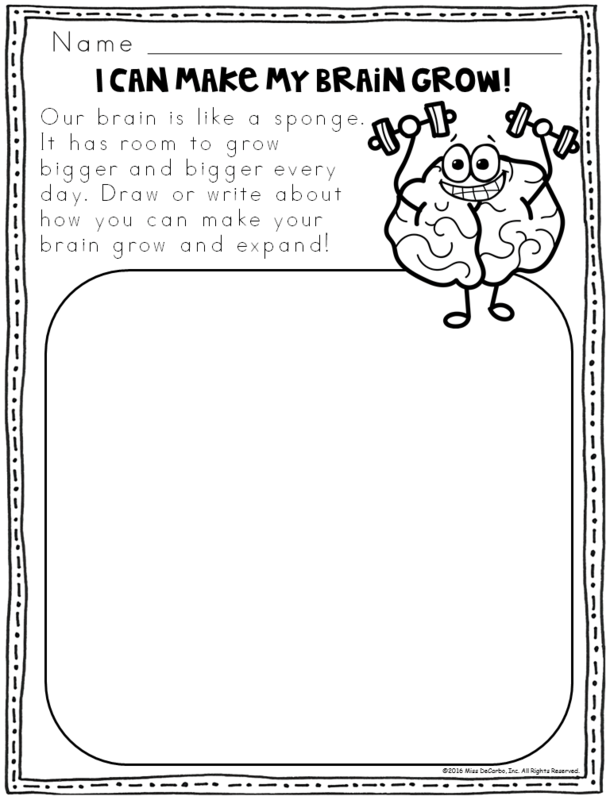 If you’d like your own copy of my differentiated growth mindset printables to use with your Growing Brain kits, simply clickthe button below to download your copy for free! 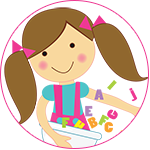 « Miss DeCarbo’s New Website: Welcome Teacher Friends!